On December 2nd 2016, an interdisciplinary workshop took place at the University of Warwick on the social aspects of driverless cars. This subject featured prominently in a recent House of Lords report on the future of autonomous vehicles, and the following workshop report details some insights the workshop generated into the challenge of anticipating societal change in this area. The Warwick workshop explored the potential of creative social research methods - such as design research and debate mapping - to surface still hidden social dynamics around the operation of intelligent technologies in everyday environments, and to complement more established approaches to societal testing of these technologies. Activities included 1) a presentation of preliminary results of ‘issue mapping’ research on driverless cars using digital methods of social media analysis; 2) a creative design exercise inside the WMG driver-in-the-loop simulator; 3) a collaborative mapping activity aimed at ‘surfacing’ social implications of the introduction of driverless cars in the UK. The main aim of the event was to bring together a small group of social scientists, design researchers, engineers, civil society representatives and policy makers in order to test the potential of these methods to contribute to wider research initiatives on societal acceptance and engagement with driverless cars. The workshop’s overall finding is that creative methods have a distinctive contribution to make in this area, in particular concerning emergent, interactive effects arising from engagement with new technology in real-world social settings. For these methods to produce lasting insights, however, what is required is a more systematic formulation of the challenges involved in the socialization of intelligent technology in today's digital societies, as well as further interdisciplinary exchanges between field-based and university-based social research in this area. ‘The social, behavioral and societal aspects of AVs [Autonomous Vehicles] are under-researched and most of the literature has focused on the technical aspects’ says the House of Lords Science and Technology Committee in their recently published report Connected and Autonomous Vehicles: The future?1 . The report also identifies two important reasons for why this is so. First, while there has been much recent interest in the capacity of driverless cars to operate in social environments, such as on public roads, much of the current research on this topic is engineering-led. This applies to hi-profile street tests by tech industries like Google and Uber, but also to recent government-supported street trials in the UK involving CAVs, in Milton Keynes and Greenwich. Here street demonstrations have served as an occasion to showcase UK-based innovation and industry-university collaboration between technical disciplines such as vehicle engineering, robotics and AI and transport systems. A second difficulty foregrounded by the House of Lords report is a methodological problem, that of how to research the future. As the report puts it, ‘there is little hard evidence to substantiate the potential benefits and disadvantages of CAVs because most of them are at a prototype or testing stage. Furthermore, as with any new technology or advancements, there may be unforeseen benefits or disadvantages that have not yet presented themselves’ (Paragraph 110). As it happens, these points were addressed at a recent workshop at the University of Warwick on the social aspects of driverless cars, and this seems a good moment to share our reflections on this event. 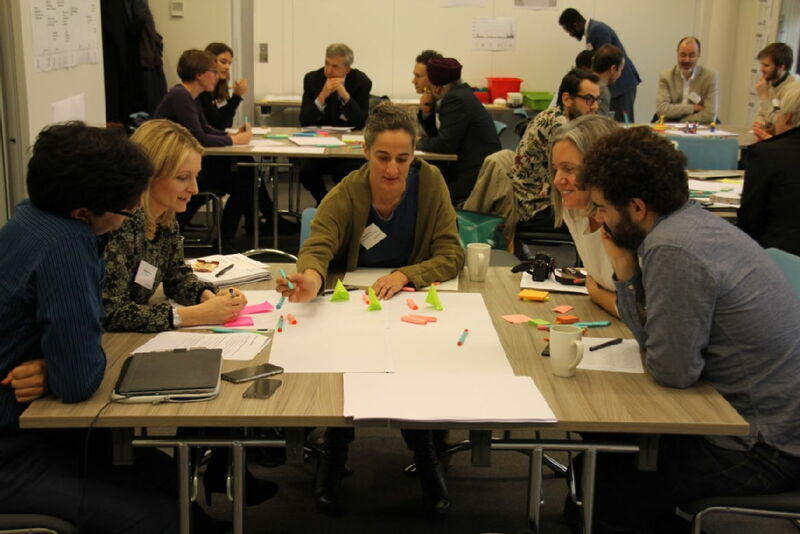 The one-day workshop, which took place on December 2nd, was entitled exploring the social aspects of driverless with creative methods, and brought together an interdisciplinary group including sociologists, design researchers, vehicle engineers and mobility experts, civil society representatives and policy-makers from a range of UK institutions2. 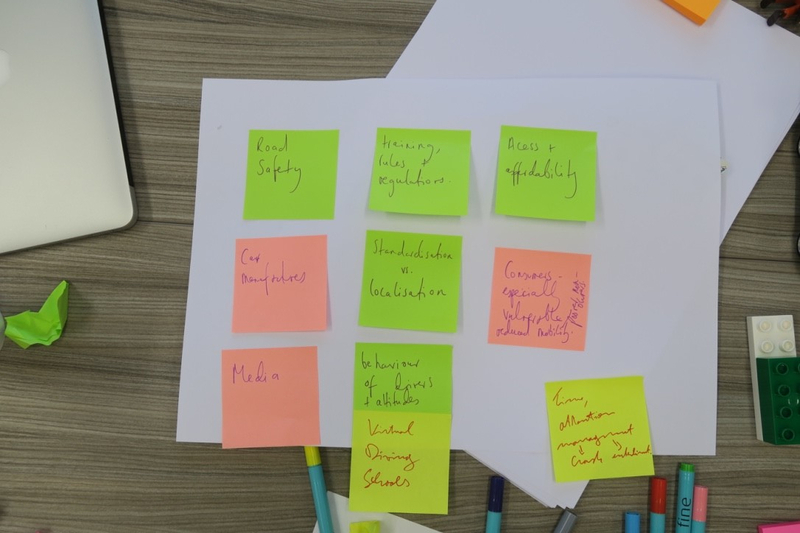 While ‘creative methods’ is a broad category, the workshop was concerned with two methods in particular – participatory design and digital methods of issue mapping (about which more in a minute). The rationale provided for using them to investigate social aspects of CAVS had precisely to do with the challenge mentioned above, that of how to research social changes that are not yet observable in the present. A second objective is to use creative methods to expand and open up - via creative research - prevailing understandings of what the 'social aspects' of driverless consist of. In the area of CAVs, much current social research focuses on the observation of behaviors in the field – how do drivers and other road users interact with CAVs? – and attitudes – measuring opinions through focus groups, surveys and design interaction research (MIT AgeLab; UK Autodrive Survey; Venturer Focus Groups; HI-DAVe). However, neither of these conceptions - the social as interaction, or as attitude - is very well attuned to mapping out new forms of sociality - new ways of relating - that may be emerging in the wake of the introduction of CAVs. Taking up non-conventional, creative social research methods like participatory design and digital methods could then provide a way to complement existing social research approaches in the following way: using creative methods to facilitate engagement with driverless cars we can get to latent social aspects of driverless cars, to measure not only observable interactions or given attitudes, but to examine emergent, not-yet-explicit ways of engaging with driverless made newly possible by their introduction into society – to help to 'surface' still hidden social aspects of CAVs. 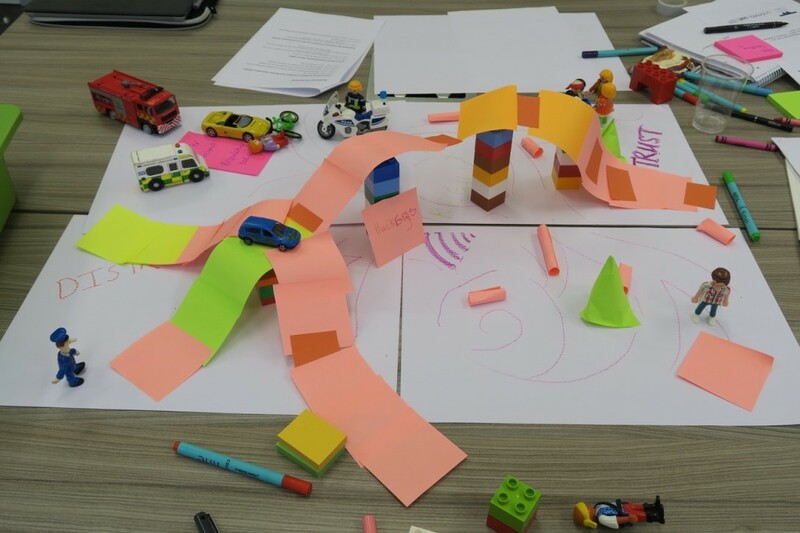 While the aims of workshop were thus methodological, our approach was practical: through a number of group exercises, we tested the capacity of creative methods to 'surface' social aspects of driverless in a participatory manner. We started off the day by asking participants to mention one key social issue raised by driverless cars. The issues mentioned included: safety; who benefits; energy and affordability; when and how to get one; how will we interact; how to keep the driver attentive; which modes of transport will go the autonomous route? ; navigation, navigation, navigation; using evidence in decision-making; trust; what problem will driverless solve? ; societal testing; digital natives/ generational differences. Some of these issues match the concerns foregrounded in the House of Lords report (safety, sustainability, affordability, cybersecurity) but the workshop's issue list also adds perspectives: that of users, consumers, experts, and citizens/politicians of the future. The subsequent workshop exercises expanded and elaborated these initial issue definitions. The first creative method introduced was issue mapping, a set of computational and visual techniques for locating, analyzing and displaying debates and controversies about current affairs, as they unfold on online platforms like Twitter (for more info see www.issuemapping.net). For this workshop, Noortje Marres, Ana Gross and Sam Hind of CIM (the Centre for Interdisciplinary Methodologies) had mapped debates about driverless cars – and related terms like CAVs – on Twitter and Youtube between June and November 20163, which we presented in the form of posters hung across the workshop room. In presenting these issue maps to workshop participants, however, the main objective was not to inform them about social issues raised by driverless cars – an issue area in which most participants were already well versed. Rather, the aim was to provide participants with a pool of issues – as well as actors – which they could use as ingredients for a creative exercise in ‘issue-scaping.’ For this exercise, participants were invited to read the driverless issue maps on the walls, select issue terms and actor names from the digital maps (figure 3), and then to work in groups to produce material issue and actor maps of their own using paper and playmobil figures. Such a task is similar to 'actor mapping' exercises that are used in design research, but we place particular emphasis on providing participants with ‘data stimuli’ as a way of letting wider public contexts inform the envisioning of social situations involving driverless. 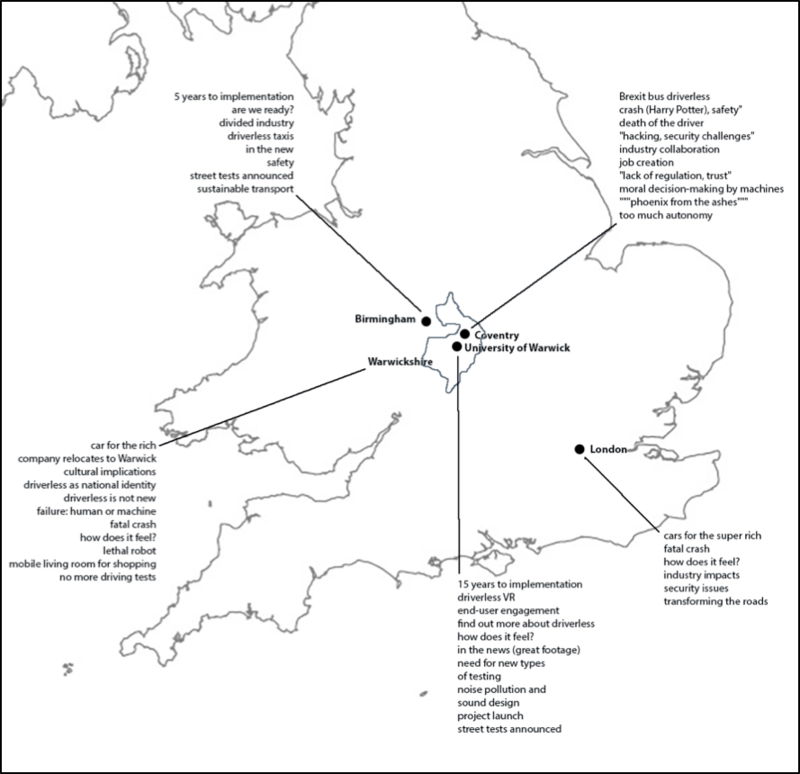 Working with social media visualisations like the Twitter map of driverless issues in the West Midlands then provides a way of 'expanding the context' of creative research - so that it does not only mobilize the participants imagination but equally elements from the wider, reported realities of driverless. Participants bravely took on the rather open-ended task, producing various scenario’s– including a dramatic moment involving an emergency service vehicle caught in traffic and an injured giraffe; a tragic design choice scenario in which the good of well-being (walking, cycling) was placed in tension with the good of independent mobility (driving); and a so-called 'hackable' trust bridge connecting social environments to R&D laboratories, that is required for CAV’s to be socialized in the right ways (Figure 5). These scenarios made particular issues salient – the prime importance of safeguarding critical infrastructure; more or less tragic trade-offs between mobility and sustainability in addressing transport challenges; science-society relations, etc.. As such, these issue-scapes put on display the dramatic potential of driverless cars (and their futures). But they also show how demonstrating this potential is dependent on the ability to imagine actual events involving driverless: an accident, a hack. At least in this sense, the scenario’s produced were in continuity with the online debates, where two recent crashes involving cars in auto-pilot, one in Florida in May and one in Beijing reported in September, generated by far the most attention. But, in contrast to most public reporting on these crashes, however, the morning’s issue-scapes brought into play new types of social actors: the elderly, the injured giraffe, emergency services, school children. As such, creative methods are key means to articulate specifically social futures where CAV’s play a role. In the afternoon, an exercise designed by Rebecca Cain and Arun Ulahannan of the Experiential Engineering Group at WMG took the project of generating issue-scapes for driverless cars to the next level: they invited workshop participants into to the Driver-in-the-Loop simulator in the International Manufacturing Centre at WMG, asking them to plot an issue landscape in this physical environment. 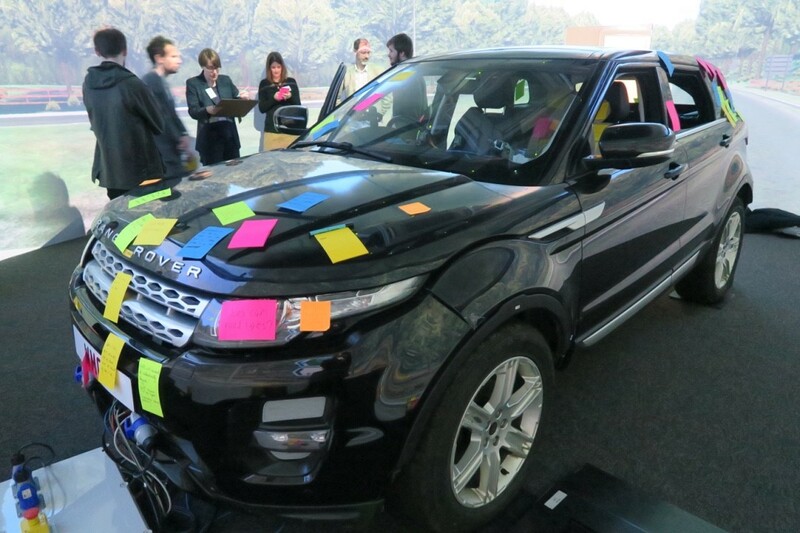 After an introduction to the simulator by Prof Paul Jennings, participants received instructions as to how to produce an issue scape by annotating the simulator, using sticky notes to annotate objects present in the simulator – like the car itself, or the stretch of Coventry road projected on the 360 screen surrounding them (Figure 6). There were also cardboard figures available for annotation, representing human actors and cardboard boxes representing non-humans (machines; technologies; institutions; etc.). While participants were clearly fascinated by the simulator itself, they also made significant efforts to locate some of the issues raised in the morning in the driverless simulator environment –in doing so generating further issue articulations. For example, ‘the elderly’ were introduced in the setting in the form of an ‘old lady’ cardboard figure, which was settled into the back seat of the car, with a note on the window noting ‘a dashboard that says 'old lady on board': stigma’. Indeed, several annotations highlighted what we workshop organisers recognized as emergent social effects – meaning social phenomena that do not already exist out there in the social world, independently of driverless cars (such as ‘childcare’; or ‘leisure’), but which arise out of interaction with new technologies. Other examples of this included a sticky on the car, which read: ‘new forms of road rage, what are the rules?’; and another: ‘new trends: the prestige of retro: the experience of driving’. But there were also issues thrown into the mix that we had not necessarily anticipated: several annotations dealt with moral concerns: ‘Will all accidents be automatically logged? Guilt defined on the spot?’. Other annotations were more poetic, and open-ended: ‘Heavy rain snow sleet, ‘end of the world’ weather’ was written on the sky, and on the window ‘car as a space for thinking/reflection’). Many comments were playful, sometimes riffing ironically on issue terms already brought into play – such as: ‘basket for collecting dead animals; ‘couldn’t crash the lady’, and ‘skateboarder, wants to spook the car but not the old lady’. As such, the simulator proved effective as a social research setting, one generative of latent insights. Prior to the exercise, we had surmised that the simulator presents a useful in-between space for social research: one located between the naturally existing environment in society (the road) and the artificial world of modelled transport systems (the computer model). As discussed above, we had speculated that the simulator could be especially conducive to the articulation of the not-yet; of latent social phenomena. But the results of the annotation exercise made us aware of other possibilities. Many of the comments were location-specific: they made use of the particularities of the simulator environment – the sky; the deep black letter back seat, to populate the issue scape (‘end of the world weather,’ ‘the old lady’). However, there were also things that proved more difficult than anticipated: for example, how to make inferences from the issue definitions that were generated in the simulator? It was possible to ascertain which elements of the morning discussions had found their way into the simulator and which hadn’t, but which were the issues that especially deserved further exploration after the afternoon exercise, beyond the simulator? Answering this question would have required another workshop activity: a review and selection of the annotations produced. It would have required another workshop day. Driverless vehicles are already here, Gateway in Heathrow, the DLR in Greenwich. Why, then, do research agenda’s say that the investigation of ‘societal acceptance’ should take priority: what is there left to accept if they are here already? Formats and visions of social interaction are already imbued in driverless technologies but current social research in this area seems to assume that CAV’s are still ‘a-social’, that they require to be socialized in some way or the other. Further research needs to be conducted on how assumptions about social interaction, impact and acceptance are embedded in these technologies, and how this plays out in testing scenarios. Much social research on driverless focuses on interaction between cars and road users in the immediate environment. But a key aspect of driverless cars is connectivity and scalability. Doesn’t this mean that we need to approach social interaction as situated in a networked environment? How do we scale up - or out - from the immediate, social setting to wider, societal problems, like obesity? Modelling is one way, but models in and of themselves are unlikely to capture emergent social effects. When mobile phones came out nobody anticipated that the phone would be the less used feature. Instead, a range of other social uses became more prominent (texting, photo sharing, navigation). To what extend do self-driving cars present a fundamental social shift? Is the sharing economy capable of displacing the individualistic, driver-centered model implicit in today’s car culture? Elaborating on this last question, one participant noted that ‘policy agenda's somehow need to respond to the social shift in digital culture.’ To be sure, this ‘social shift’ in digital culture is in some ways a vague idea, as it alludes to innovative propositions like sharing and on-demand services, post-ownership models of car use, crowd navigation, and so on, many of which are currently contested, and only in the experimental phase of implementation. Indeed, it is today subject to debate whether and how ‘social’ the sharing economy is or can be, given the concerns associated with flexible labour, and the reluctance of some of the digital players to identify as ‘transport services.’ Furthermore, the frameworks guiding debates about automotive innovation seem to remain, on the whole, individualistic – debates about agency, accountability as well as marketability continue to be eminently pre-occupied with ‘the driver.’ However, the idea of a ‘social shift’ in automotive culture is also challenging for a different reason. Whatever the ‘social shift’ in the digital economy will end up meaning, it is likely to challenge fundamental categories – after all, the wager is that cars may no longer have ‘drivers’ – will they become users instead? As interaction between road users is expected to be increasingly mediated by dashboards and displays, will the very notion of ‘road etiquette’ become something different? Might even the very category of ‘behavior’ become something different in a world were actions and objects are routinely tracked and people may adjust themselves to this new reality? Whether or not these questions should be answered in the affirmative, they point towards another challenge to which creative methods are well suited: we cannot assume that we know the identities and roles of the actors - e.g. (cyclists, passengers) that will constitute driverless futures. We will need to speculate about the new types of actor types, capacities and relations that may come about in automated mobility environments. 2http://www2.warwick.ac.uk/fac/cross_fac/cim/news/?newsItem=094d43f55891a16101589693ba560bdf. The workshop was co-hosted by Noortje Marres from the Centre for Interdisciplinary Methodologies, University of Warwick; Rebecca Cain of the Warwick Manufacturing Group (WMG); and Lucy Kimbell of University of the Arts London (UAL). 3This dataset included 2.372.199 Tweets, collected between 14 June and 7 November 2016 using TCAT, the Twitter Data Capture and Analysis Toolkit. Our query terms were autonomous cars, autonomous vehicle, connected and autonomous vehicle, connected car, cooperative car, self-driving car, CAV, autonomous vehicle, autopilot, driverless, selfdriving.